WHAT WE DON’T KNOW EXPLAINS WHAT WE DON’T UNDERSTAND. This is why the work of the Gold Anti-Trust Action committee, GATA, is to be admired. Much of the exposure of the US government’s hidden hand in the manipulation of the gold markets is due to GATA’s work. What most still do not understand is the extent of that hidden hand and its effect on America, a nation many believe to be free. The sewers of influence that course through America’s financial system are hidden from the public eye and for good reason. If Americans understood the intent and motives of those who control the nation’s finances, they would realize they’re the patsies in an on-going suckers game with political parties the hired hacks who work on behalf of those who run the country; but, of course, Americans don’t understand and the game goes on. On GATA’s Board of Directors is Catherine Austin-Fitts, a person not known to many. She should be. From 1978 to 1989, she was at Dillon Read, a powerful and prestigious New York investment bank (later merged with S.G. Warburg and then UBS) where she was both Managing Director and a Member of its Board of Directors. It was at Dillon Read where Catherine Austin-Fitts witnessed America’s heavily denied transformation, a transformation where America’s elites and Wall Street conspired with the Clinton Administration to turn Nixon’s “War on Drugs” into profit-driven genocide. Because of Wall Street’s participation in America’s War on Drugs, large amounts of money were involved; and to start the money flowing, more Americans would have to go jail and they did. It’s no coincidence that the US is now the world’s number one jailor with the highest percentage of its citizens behind bars. Under President William Jefferson (No, I did not inhale) Clinton, America’s prison population began to significantly rise, surpassing the numbers arrested under President Ronald Reagan. Thus began the diaspora of America’s underclass, especially black Americans into increasingly private prison cells in larger and larger numbers. GATA was incorporated by Bill Murphy in January 1999 to advocate and undertake litigation against illegal collusion to control the price and supply of gold and related financial securities. Exactly one year later in January 2000, Bill Murphy was to become personally acquainted with Martin Armstrong of Princeton Economics. At the time gold was $280/oz , silver was $5.18 and GATA’s Bill Murphy was hearing rumors that Martin Armstrong was heavily involved in shorting gold. Then, on January 5, 2000 the following article, a revelatory bombshell, was posted on Kitco. years, I’ve seen it first hand. Buffet is not lily white and this silver purchase of his was not the first. The manipulation by Phibro in 1995 when they exercised the call options way out of the money was executed by Andy Heck who now works for Republic. The CFTC went to Phibro demanding to know who the client was behind the trade and they refused to give up the name. The CFTC did not do their job, as usual, and just walked away demanding that they exit the trade. Phibro was owned by Salomon Bros and the authorization to squeeze silver was given personally by Buffet. Does anyone really think that a small sub like Phibro could do a $1 billion trade without board approval from above? It doesn’t end there. Bribes were paid to Russian officials to “recall” platinum so it could be inventoried. Republic helped Tiger corner the market in palladium and stored it for them just like they moved the silver from NY to London for Buffet. This thing even goes back to the manipulation of the US Treasury Auctions. The govt boys are so stupid, when they threatened to take the license away from Salomon Bros, Buffet came to the rescue. Ha! He was behind that trade as well and his name was concealed then, as always. Then that trader left and started LTCM and had a real merry old time. Look at who his investors were! Just before it blew up, Buffet agreed to bailout that operation and wrote a letter stating that if his offer were ever revealed, it would be void. That letter was published in the WSJ because it blew up before Buffet could put the deal to bed. The point is, Armstrong was trying to fight the crowd. He knew what was going on and the word inside the bank was that he might even have tapes of conversations between a lot of the players. Everyone is really worried about that for sure. These guys take the market up get all you suckers believing the rally is real and then slam it again. How do you think they make their billions? They don’t care about bull markets. They shag the markets to make their billions off of the people who don’t have a clue. They rotate between the markets. All the same names were on the short-side in copper. Sumitomo tried to fight these guys. They baited the Japanese into the trades offering them untold credit. They then would short copper against them. Sumitomo tried to defend their position and ended up buying the entire inventory. When they had Sumitomo loaded, they ran to the authorities and did them in calling it a manipulation. They made a fortune on that short trade. To add insult to injury, Sumitomo ran to Goldman Sachs for help, Goldman started selling thousands of contracts in copper that day and then accepted the work out the following day after front-running their own client. Jimmy Goldsmith was involved in this one as well as Safra, Tiger and a host of others. They amazingly are all on the right side of every one of these trades. Hell – bribes were even paid to bank officials at the Central Bank of Thailand to start the Asian Crisis! That was the evidence the Japanese took to the G7 meeting and demanded controls against the organized hedge funds. The US govt refused to do anything against the group of players because this thing is so dirty nobody wants the truth out there. They told the Japs they would agree to sanctions only. That’s why Armstrong is being served up as the Xmas turkey. Quite frankly, he knows too much. York on behalf of a rival group of thugs in Russia and because Republic hates Bank of New York because they are not part of the club. These markets are never going to breakout until someone breaks up this organized mob of billionaires. The govt is either too stupid or they are involved with them – a high probability! After all, Armstrong had a $1 billion credit line in the bank and everyone knew it. Suddenly, his credit line was pulled and Republic took $500 million of his clients money pretending it was never there. That order came from good old Mr. Safra himself and was carried out by George Wendler personally. And if anyone believes that story about Safra’s death, I guess they believe in Santa Claus and a few other sudden deaths when the heat got turned up. If Armstrong or his clients got Safra on the stand, the whole thing could have unraveled. His bodyguard was changed just after this affair started. You fill in the blanks. All this stuff is on tapes, docs and emails. The question is, will the govt go along with the big boys and cover everything up again? [They did] If so, they say already Armstrong won’t make it to trial. They cannot afford a open trial with everything Armstrong knows. He probably knows far more than what has been written here. They just can’t afford for the world to know how rigged this game truly is and how these billionaires really make their money at the expense of everyone else. When investors have sufficient wealth and power, rigging markets is preferable to investing as the odds are far better when chance is replaced by manipulation; and, the belief that market regulators, e.g. the SEC, the CFTC, the FDA, etc. are neutral and honest is as vain and naïve as believing JFK was gunned down by a lone gunman or that Building 7 in the World Trade Center suddenly collapsed on 9/11 without any intervening exogenous force; or that bankers Edmund Safra, Michele Sindona, and Roberto Calvi were not in trouble with the powers that be when they were murdered—Safra burned to death by his newly-hired bodyguard trapped in his fortress-like penthouse in Monaco, Sindona poisoned in prison after drinking coffee laced with cyanide and Calvi found hanging by his neck beneath Blackfriar’s Bridge in London, his pockets filled with bricks while out on bail. The governments and bankers behind the manipulation of gold are running out of options. Their supplies of physical gold are dwindling as demand is rising. Their attempts to force down the price of gold has lasted almost 30 years but even evil runs out of luck. Their attempts to re-liquefy the markets are backfiring as Gary Dorsch, editor of Global Money Trends, points out that when central banks now pump in new debt, it forces the price of gold higher: The Fed has monetized trillions of dollars of new debt, through its QE scheme, and many investors have lost all faith in the value of paper money. 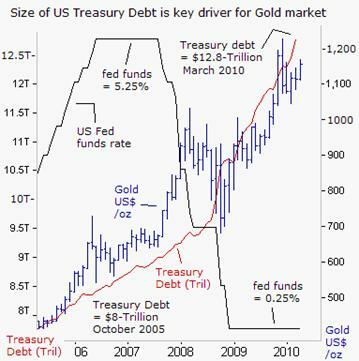 In fact, the ballooning size of the US Treasury’s debt, which hit a record $12.8-trillion last month, has been a steady linchpin supporting the historic rally in the gold market over the past decade. As a general rule of thumb, every $1trillion of fresh debt issued by the Treasury equates with a $125 /ounce increase in the price of gold. 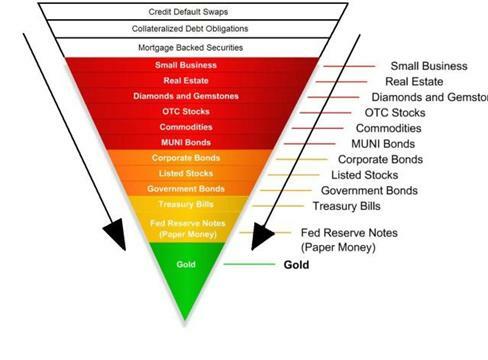 As long as the Fed and G-20 central banks continue to peg ultra-low interest rates, – and G-20 governments continue to flood the debt markets with huge quantities of IOU’s, – it translates into monetization, and the trajectory for the gold market would stay bullish. Capitalism’s distinguishing feature is the nature of money used in capital markets. In his book, Capitalism (Polity Press 2008), Geoffrey Ingham writes: It might seem unnecessary to draw attention to the fact that money is an essential component of the capitalist system…Capitalist societies…share certain fundamental features: (i) the private credit and the banking system ‘money multiplier’: (ii) state debt as the ultimate foundation of credit-money; (iii) the pivotal role of the central bank: and, (iv) the three cornered struggle between state, money market and taxpayer. Capitalist economies came into existence when the Bank of England was established in 1694, a central bank which issued money in the form of debt, a monetary phenomena that had never before occurred in history. In capitalist economies, money is debt. The substitution of debt for savings as money led to the acceleration of Gresham’s Law where bad (debt-based) money drives out good (savings-based). This explains much about our present circumstances. The issue of free versus managed markets came only after the appearance of communism. The rise of communism shifted the focus away from capitalism’s shortcomings (debt) and advantages (credit) to communism’s egregious, obvious and brutal oppression, a phenomenon that occurs whenever and wherever power is centralized. The greater the centralization of power the greater the opportunity for oppression. It should be understood, especially today, that capitalism is no more a protector against oppression than is democracy (see Democracy in America by Alexis de Tocqueville) and, if capitalist/democratic societies, e.g. the US, the UK, the EU, etc, continue their present trajectory; their end will be but another iteration of state tyranny. The US Patriot Act—Uniting and Strengthening America by Providing Appropriate Tools Required to Intercept and Obstruct Terrorism Act of 2001—is the blueprint for the new America. Written by legal hacks, foisted on the nation by the Republican Party in the darkly contrived shadow of 9/11 and extended by the Democrats, the right of the US government to intrude and override America’s civil liberties is now the law of the land. The above was excerpted from an email sent to GATA’s Chris Powell from Martin Armstrong in early January 2000. The court receiver who accused Mr. Armstrong of contempt was Alan Cohen, a lawyer at the powerful and prestigious firm, O’Melveny & Myers. On January 14, 2000, Martin Armstrong was arrested based on Mr. Cohen’s allegations. For the next seven years, Armstrong would be held without trial. Appellate courts would dismiss Armstrong’s appeals that such an unprecedented incarceration on contempt charges constituted cruel and unusual punishment; the courts instead found that cruel and unusual rulings apply only to persons, not to corporations or corporate officers such as Mr. Armstrong. This is legal parsing at its most scurrilous, equal to those written by John Yoo, the Bush Administration lawyer who provided cover for America’s legalization of torture; cover, that if extended, could exonerate those convicted at Nuremberg. Such is the current state of American jurisprudence, a country based on the rule of law—or, so it proclaims. If so, the question must then be asked: Whose rule? Whose law? And, most importantly, whose country? If you haven’t asked those questions, you don’t know the answers. As would be expected, those who serve power, e.g. John Yoo, Alan Cohen, Bill Clinton et. al., are well-rewarded in a country as wealthy and powerful as America. Yoo is a professor at Boalt Hall School of Law at UC Berkeley, Cohen is Executive Vice President and Global Head of Compliance at Goldman Sachs and Clinton receives $5-$8 million annually in speaking fees as a respected former US president. Martin Armstrong’s Pi Cycle Economic Confidence Model which predicted the exact top of the Japanese stock market is a noteworthy achievement in matters of economic theory. While incarcerated Armstrong continues to write, even when in solitary confinement; and when he’s not allowed access to a typewriter, he will use a pen, see http://armstrongeconomics.com/writings/. Martin Armstrong in prison at Fort Dix Federal Penitentiary and Catherine Austin-Fitts, Bill Murphy and Chris Powell at GATA deserve our support in these consequential times. John Yoo, Alan Cohen, Bill Clinton and the many others who serve power and wealth do not. In America, real power is held by those who pay Yoo, Cohen, and Clinton to do their bidding; coalescing power, control and wealth in a nation that still believes itself free—while those who are governed remain oblivious and unconcerned as to their true state. Sleep, America, sleep Dream, America, dream For only in your sleep and dreams Are you free and awake. America, however, is about to wake up. Its awakening will not be pleasant. The pain has only just begun. Buy gold, buy silver, have faith.